“The whole world should clearly remember it was the US who first declared war on our country,” – they won’t, you know. Big mistake if Kim thinks that. Despite the utter cynicism of US actions, technically they haven’t attacked if they stay outside of North Korea’s airspace. This extends to their international borders, 12 Km out from the coast line. This kind of incident plays out regularly on the borders with Russia and China, when the defending power scrambles war planes to see off the attacking planes. This occasionally goes wrong leaving both sides arguing about exactly where the incident happened. That won’t happen here as North Korea’s planes aren’t fast enough to catch a B-1B, and a missile would be an act of aggression. I’m sure China will advise North Korea privately that they will not defend them if they do this. The North Korean foreign minister says Pyongyang has every right to take countermeasures against US aggression, including shooting down warplanes, even if they are not in North Korean airspace. Speaking to reporters in New York on Monday, North Korean Foreign Minister Ri Yong Ho said that US President Donald Trump has effectively declared war on Pyongyang, meaning all options were on the table for his country’s leadership. “We’ve not declared war on North Korea. Frankly, the suggestion of that is absurd,” White House spokeswoman Sarah Sanders told reporters on Monday. Earlier, an open letter from North Korea to several international parliaments said that President Trump’s remarks in his UN General Assembly speech last week amounted to an “intolerable insult to the Korean people, a declaration of war against North Korea and grave threats to the global peace,” the Korean Central News Agency (KCNA) said in a report. Speaking before the UN General Assembly last week, Trump said that while the “United States has great strength and patience,” it may have “no choice but to totally destroy North Korea” if the US or its allies are threatened. Tensions have been running high on the Korean Peninsula, with bellicose rhetoric and provocative military activities coming from both the Democratic People’s Republic of Korea (DPRK) on one side, and the United States and South Korea on the other. 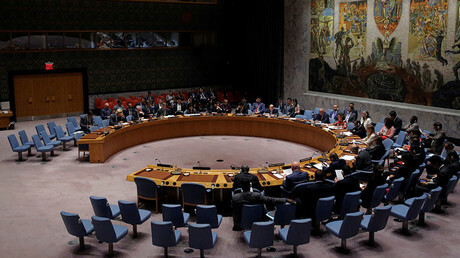 Pyongyang has conducted several missile and nuclear tests in defiance of rulings by the UN Security Council, while the US has continued to carry out joint exercises with South Korea and Japan while ramping up its own war of words against Pyongyang. This report to the statutory Commission to Assess the Threat to the United States from Electromagnetic Pulse (EMP) Attack by Dr. Mark Schneider, National Institute for Public Policy, (2007) is available at http://www.nipp.org/wp-content/uploads/2014/12/EMP-Paper-Final-November07.pdf . It has a special chapter on the North Korean threat, which given the direct threats made by the North Koreans in recent weeks should be taken very seriously. Whilst we have no way of knowing whether NK’s “thermonuclear bomb” has been optimised for enhanced EMP (as opposed to explosive output) there are clear indications that it could have been designed that way from the beginning, given that much of China’s nuclear arsenal has gone that way. Above all, as deterrent devices, nukes are not strictly intended to be used, but they get their defensive value from the catastrophic nature of their results. Since improving the ICBMs accuracy is unimportant for EMP threat, that relieves NK of the necessity of doing all that complex work. nations around the world that used these satellites would also be greatly affected. The Saker is very good on military tactics, and when he says he is worried this situation in Syria might spiral out of control, I have to say I agree with him. However the size of the oilfields in eastern Syria are not big, Syria had its “Peak Oil” in 2002 at 667 kbpd and by 2011 it consumed all it produced. That left Assad with the task of finding money to import oil for the first time. At the same time, a drought was making agriculture very difficult and farmers were forced to leave their farms and head for the cities, where the high price of fuel and bread were making life very difficult. A perfect situation for an uprising, and that’s what they got. Thus Peak Oil played an important role in destablising Syria. The same is true of Egypt. Something rather unprecedented just happened in Syria: US backed “good terrorist” forces attempted a surprise attack against Syrian government forces stationed to the north and northeast of the city of Hama. What makes this attack unique is that it took place inside a so-called “de-escalation zone” and that it appears that one of the key goals of the attack was to encircle in a pincer-movement and subsequently capture a platoon of Russian military police officers deployed to monitor and enforce the special status of this zone. The Russian military police forces, composed mainly of soldiers from the Caucasus region, fought against a much larger enemy force and had to call for assistance. For the first time, at least officially, Russian special operations forces were deployed to rescue and extract their comrades. At the same time, the Russians sent in a number of close air support aircraft who reportedly killed several hundred “good” terrorists and beat back the attack (Russian sources speak of the destruction of 850 fighters, 11 tanks, three infantry fighting vehicles, 46 armed pickup trucks, five mortars, 20 freighter trucks and 38 ammo supply points; you can see photos of the destroyed personnel and equipment here). What also makes this event unique is the official reaction of the Russians to this event. Here it comes. If you were wondering why there has been so much attention paid to Myanmar, when we hear nothing about the plight of Bangladesh which is in a much worse condition due to floods and extreme poverty, it is because the US wants to put sanctions on Myanmar as punishment for its closeness to China and involvement in China’s One Belt One Road initiative. The US doesn’t care about the human rights of the Rohingyas anymore than it cares about the human rights of Afghans. What it DOES care about is poking China in the eye. US Vice President Mike Pence has called on the UN Security Council to take action to resolve the crisis in Myanmar, which led to hundreds of thousands of Rohingya Muslims fleeing their homes in recent weeks. “The United States renews our call on Burma’s security forces to end their violence immediately and support diplomatic efforts for a long-term solution,” Pence told the UN Security Council Wednesday, using the old colonial name for the country. “President Trump and I also call on this Security Council and the United Nations to take strong and swift action to bring this crisis to an end and give hope and help to the Rohingya people in their hour of need,” he added. The vice president did not specify what action the US is calling for, but last time Washington used the words “strong and swift” actions was in relation to Venezuela in July. Sanctions against the country’s leadership followed. Pence also told the UNSC that Myanmar’s leader Aung San Suu Kyi assured US Secretary of State Rex Tillerson on Tuesday that returning refugees have nothing to fear. Myanmar’s military unleashed a crackdown on Rohingya settlements following an attack carried out by a group of Rohingya militants on a number of police posts in northern Rakhine on August 25. UN human rights chief Zeid Ra’ad al-Hussein called the crackdown “clearly disproportionate” and “textbook example of ethnic cleansing,” as it led to around 400,000 Rohingya people fleeing to neighboring Bangladesh, according to human rights groups. Last week, Amnesty International released satellite images which the group says show Rohingya villages set ablaze. The organization has attributed blame to Myanmar’s security forces, as well as “vigilante mobs,” saying it was done to drive the people out. “When the military came, they started shooting at people who got very scared and started running. I saw the military shoot many people and kill two young boys. They used weapons to burn our houses. There used to be 900 houses in our village, now only 80 are left. There is no-one left to even bury the bodies,” Amnesty cited one unnamed 48-year-old man, saying his village was attacked on September 8. The human rights group said the scale of destruction could not be independently verified due to governmental restrictions on outside access to the area. On Tuesday, Aung San Suu Kyi broke weeks of silence on allegations of ethnic cleansing against the Rohingya population and delivered a speech in which she claimed that the majority of Rohingya villages had not been affected by violence. She refrained from criticizing the military, but said it had been instructed to exercise restraint and avoid “collateral damage” in its pursuit of insurgents. Aung San Suu Kyi, who received Nobel Peace Prize in 1991, has drawn worldwide admiration for her long fight against military rule. Two years ago, her party had a landslide victory in Myanmar’s elections, which made her head of the country’s government. It is not clear to what extent she controls the military’s actions, however. Rohingya Muslims have been largely treated as outsiders in the Buddhist-majority Myanmar. Most Rohingya were denied citizenship, leaving them stateless in a country where they were born.